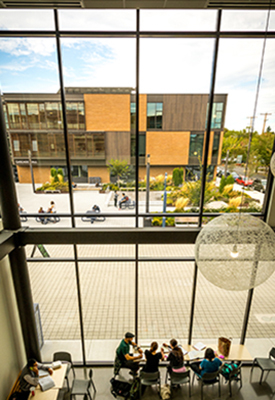 The Student Union and Cascade Hall at Portland Community College, Cascade Campus enframe a generous urban open space that’s become a social hub of activity and heart of the campus. Over an underground parking garage, Mayer/Reed designed a plaza with flexible spaces that can be adapted for a variety of student and community uses. Two elevated performance stages, three large seating decks, and multiple custom benches provide students with a variety of places to perch within a lush garden environment. Color and activity from the early childhood education program’s outdoor play area further energizes the space.